Selling your eCommerce products through affiliate marketing is one sure way to gain more customers and increase sales. As per the ShareASale documentation, it is recommended for merchants to provide data feed to the affiliates. This helps the affiliates to get the product specific link and help in conversions. ShareASale strongly recommends merchants to update their product feed to keep the affiliates updated about pricing and product quantity changes. For this, merchants are allowed to update their product feed up to 31 times a month. Follow the steps below to configure the ExportFeed plugin and generate your first data feed. – Make sure you have created your merchant account for ShareASale. – Make sure you have running website in one of our supported platforms. – Make sure you have our plugin installed on your website. Your merchant id is one of the crucial information that needs to be sent to ShareASale for uniquely identifying products as yours. For this you need to enter your ShareASale seller id while creating your feed through the Advanced command section. 4. Select the WooCommerce Category/Categories you wish to export. Note that selecting a parent category automatically includes all of it’s child categories! Click the field beside “WooCommerce Category” to select from a list of WooCommerce categories (1). A small box will appear with a list of categories to export (2). If you do not see anything, please see FAQ – No Categories . To easily manage your feeds (view/edit/delete) later, enter a name for your feed. Generated feeds can be found from ProductFeed > Manage Feeds. You have completed creating your product feed, now it is time to upload it to ShareASale. Start feed upload process by logging to ShareASale Merchant account from here. Upload the newly created CSV data feed file there. Wait for the report and if any error, please contat our support team. 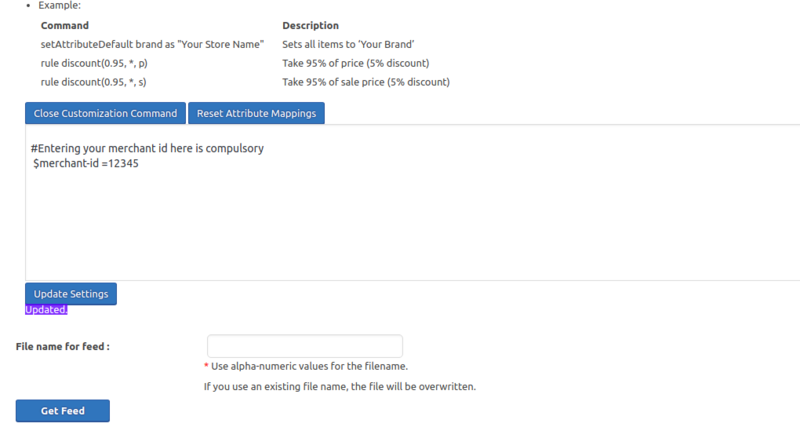 Finally check the listing of your products manually. Through ShareASale, your affiliates are able to get your proudct data and upload it on their marketing channels to generate sales for you. But what if the product data that your affilates get is outdated? This will not only waste the efforts of your affiliates but will also have an impact on your affiliate campaign by adversely impacting on your goodwill. For this, ShareASale recommends you to keep your product feed updated and submit the updated feed. The limit to upload your feed is 31 times a month. Keeping your product feed updated is easily handled by ExportFeed services. When your product data changes, you can refresh the feed and keep them updated. *Setting up FTP upload to merchants may or may not require additional cost.